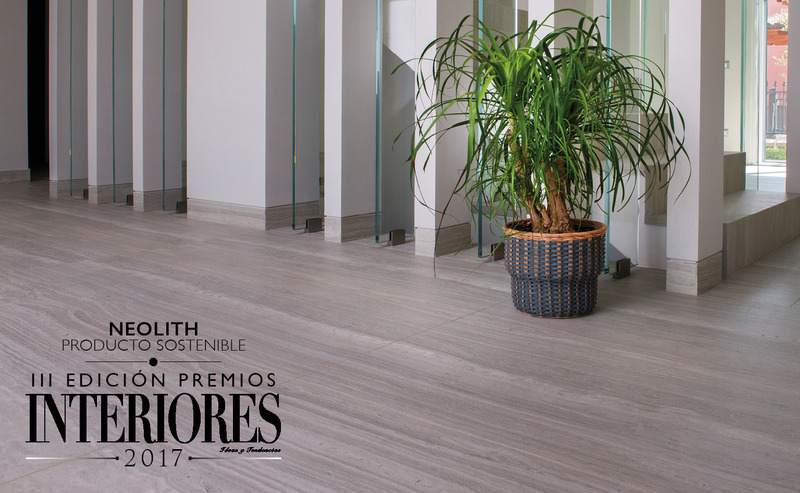 For its “quality, excellent understanding of environmental awareness”, NEOLITH® has received the Sustainable Product award granted by Interiores magazine, which took place last Thursday at the Westin Palace Madrid Hotel to celebrate its III Awards Edition. Awards that were born three years ago to recognize the talent, expertise and effort of the best creators, companies and products of the year related to the world of Design and Interior Design; for which they count in each edition, with prestigious professionals as members of the Jury. NEOLITH® is a product that combines aesthetic appeal with sustainability. A 100% natural product made with natural clay, feldspar, silica and mineral oxides. For its natural composition, NEOLITH® is 100% recyclable. Furthermore, NEOLITH® slabs are made of less raw materials than other product categories because of the thinness meaning it reduces the erosion of the soil where they are found. Neither emit toxic gases into the atmosphere when exposed to fire or extremely high temperatures. Adding to its sustainable character, a new treatment has been launched for its facades line: Neolith + Pureti. A treatment that makes the facades continuously self-cleaning in addition to reducing the contaminating agents and, thus, improving air quality.